384) Moh@lyics Weekly - Eps 9! Egypt - Argentina: The weird thing is that when we started to master the field, we were beaten! anyway, it was a good match but we could have done better. Arab Summit: Doest worth wasting my time and commenting! 6 April: I really hope that people can make a difference on April 6th and it won't be another strike that is just covered by the opposition newspapers then kol wa7ed yerawa7 beto. The great thing will be if we DON'T BUY ANYTHING on that day even food, gas,..etc. to make a point, but not going to work doesn't make sense, I think we should go to work but have any obvious sign of strike (like Japanese people do). Again the difference will be through not buying anything. It is all about the mind-set of how do we perceive EARTH. It is not an inheritance but rather a loan and we have to be aware of its interest. "We do not inherit the Earth from our parents. We borrow it from our children." 382) Pay It Forward - Again! Last Year this blog joined the pay it forward campaign and promoted for it (logo on the right navigation). This is just a reminder that paying forward is never a loss... "Ina Allah la yodee3o ajr man a7sana 3amala" Sadak Allah el3azeem. 381) Honna Al Qahira - Part XV - Don't Pee!! Can any one please explain what is this sign doing on a micro bus?!!! 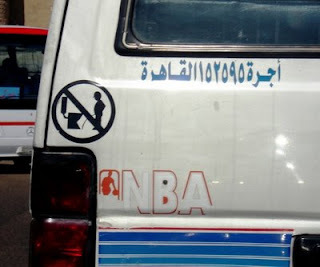 I really tried to see the link between the sign and the bus but couldn't reach a conclusion except that people (mainly men as in the pic) do urinate ON or IN the micro bus, and they are not allowed to do that anymore! Cairo University: A light at the end of the tunnel. I am really glad that the oldest and biggest university in Cairo in its 100th anniversary is finally extending & expanding by the efforts of the Egyptian people as what happened when it was established. Thanks to Labib El Seba3y in Al Ahram to lead this campaign. This should be the real role of the public owned newspaper, and this should be the role of the society. Accidents: Khalas mesh momken, accidents everyday, high ways, bridges, streets, everywhere. What happened last week with the AMN MARKAZY car is really sad. These innocent people who died after serving the whole day for malaleem have no one to blame or "compensate them". 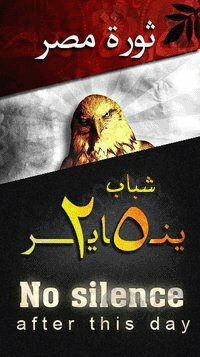 There must be a new system (not only law) to organize the traffic in Egypt, and Cairo in specific 2abl manmoot kolena. Hurghada: Akeeeeran I am back in Hurghada after 3 months. Although I am on business but I feel like I am back home. Working between Cairo and Hurghada is my real work-life balance. It is even reflected on the blog where I rarely posted fun stuff in the last 3 months. What I do here in 1 day (business or fun) I do in Cairo in a week. God Bless Red-Sea. People marry for many reasons, but usually one or more of the following: legal, social and economic stability; the formation of a family unit; procreation and the education and nurturing of children; legitimizing sexual relations; public declaration of love; or to obtain citizenship. This issue "marriage" became one of the most annoying issues for a lot of guys and girls over 30. Why was it easier zaman to get married than now? What happened to marriage in the 21st century? I am wondering why when you have the money to get married you dont have the will, and when you have the will you dont have the money, and when you have the money and the will you dont have a choice, and when you have a choice you dont have the health.....!!! Am I too pessimestic about marriage?! 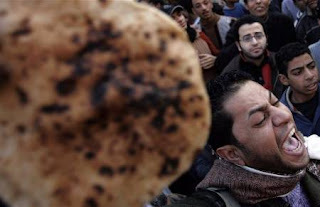 378) Dark Side of Egypt IV - Bread !!! Ya Allaaaah! 4 killed in 16 days, ya3nee more than an Egyptian dies every week because of fighting over the basic of basics. I really do not know how does the government get the guts to announce numbers about the development and reformation while the Egyptian are dying just to eat bread. How can the minister of Social bla bla bla sleep at night!!! The government that can't ensure the minimum basic necessities as bread and LIFE itself to its citizens, doesn't deserve to rule even with 100% growth rate! It seems that this is the consistent policy of our government to keep us away of the real stuff that we should care about, after the KISS wala 7araj, now Mr.Gamal El Banna said that the 1st time in committing adultery is ok as long as it is not repeated!! Ana begad mesh 3aref a3mel eih, el7anee ya Titi!!! AUC & Universities: I attended an event last week where 50% of the time the minister of higher eductation, and couple of university president were talking about AUC and how to be like AUC, what they need to know is that in order to see the Egyptian Universities like AUC they need ACTION not WORDS. 376) Save Your Time; To-do-lists ! You never know when you are going to have a great idea or brilliant insight. Carry a small notebook with you wherever you go so you can capture your thoughts. If you wait too long to write them down you could forget. A common time management mistake is trying to use your memory to keep track of too many details leading to information overload. Using a to-do list to write things down is a great way to take control of your projects and tasks and keep yourself organized. This is on the business as well as personal levels. 375) Your Power lies WITHIN ! Take a deep look at this video (Covey), and listen not just hear, watch not just see. Your real power lies within, in order to make a difference in your society, company, family, and even country, you have to take control over yourself first. Don't wait till you are in the mode, you wont be. Don't wait for the government or even the e-government. Don't wait for your friends, colleagues, or family. Just START ... Stop moaning and start DOING! القاهرة- أفتي المفكر الإسلامي جمال البنا بجواز تبادل القبلات بين الشباب والفتيات غير المتزوجين معتبرا أن ذلك يأتي في اطار الذنوب الصغري التي تمحوها الحسنات.وكان البنا قد استند في فتواه خلال لقاء معه بقناة "الساعة" الفضائية علي عدم قدرة الشباب والفتيات علي الزواج نظرا للظروف الإقتصادية الصعبة.وفي تصريحات له للعربية نت قال "لا يكلف الله نفسا إلا وسعها" وليس كل محرم من الضروري ألا يفعله الإنسان.وقال إن ارتفاع تكاليف الزواج وتأخره هو المسؤول عن هذه "الذنوب الصغيرة". Ana mesh 3aref afra7 3ashan leya 7ega abos el banat, wala az3al 3ala el 7al eli wesel leeh 3olama2 el Ummah! American Elections: I think that if Clinton and Obama didn't team up at this stage as President-Vice, there will be a great possibility for another republican idiot to become the president and keep the Bush ideology running. Sawiris: As I said here 1 year ago, this man knows how to succeed.. he is the 60th richest man on earth now with a 70,000,000,000 LE fortune (ma-shaa-Allah) and steadily heading to top 20! Weather: I really became confused about the weather in Egypt, one day it is raining and 6 degrees, the other day it is hot like hell and 36 degrees in shadow! i.e. 7ar geddan sayfan, 7ar we bard ma baed shetaa2an!! El wa7ed maba2ash 3aref yelbesh eih! 372) Code of Governance howa el 7al ! With all my respect to Ekhwan bloggers, but I am announcing that I am against their idoilogy. I don't hate them - yet- but I severely don't agree with them, or in other words "Ana Mesh Ekhwan" or "Ekhwan Mo7eb". I see that there is nothing called "7okm Islamy (Islamic Governance)" but rather "mowasafat 7okm Isalmy (Islamic Governance characteristics). Something like the Islamic dress, there is nothing called Islamic dress that every Muslim should be wearing, but there are some characteristics that we can combine in different percentages to come up with dozens of fashion combinations that fits the Islamic code of dress (loose, not transparent,...etc). Ruling in the name of God or saying that this is the only solution and other than that is against what God wants is ridiculous and is a losing model everywhere. So I suggest to have a Code of Governance (if I may say), as the common ground that the Civil forces and Ekhwan stand on for the benefit of Egypt and the whole Muslim nation. This code states that the government must be: Honest, sincere, have justice, working for the welfare of the whole & sum, not discriminating based on religion or gender, against corruption, respecting the personal freedom as long as it doesn't hurt the society....etc. I honestly believe if such code is applied, there shouldnt be ekhwan moslmeen and ekhwan gheir muslmeen, there will be only EKHWAN MASRYEEN whether muslmeen or mase7yeen. 371) Mubarak ranks 7th, bas!! This is a list of the longest serving presidents after the retirement of Castro, all of them has been on the top of their countries for more than quarter of a century. Do you think that there is a chance that Mubarak will be the first soon?!! Between brackets is the country ranking in global human development. Omar Bongo ascended to Gabon's presidency Dec. 2, 1967, after his predecessor's death. In his 70s, Bongo faces little political opposition in oil-rich West African nation of 1.5 million. Moammar Gadhafi of Libya took power through a Sept. 1, 1969, military coup in the oil-producing North African nation of 6 million people. In his 60s. Maldives President Maumoon Abdul Gayoom, in his late 60s, came to power Nov. 11, 1978, in the Indian Ocean island nation of 370,000. Teodoro Obiang of Equatorial Guinea, in his mid-60s, seized power in the oil-producing West African nation of 500,000 citizens in Aug. 3, 1979, coup. Angola's Jose Eduardo dos Santos took power Sept. 21, 1979, after winning election under one-party system then governing the oil-producing southern Africa nation of 12 million. In his 60s. Robert Mugabe has been only leader of Zimbabwe's 12 million people since April 18, 1980, independence from Britain. In his 80s. Egypt's Hosni Mubarak, 80, became president Oct. 14, 1981, after assassination of Anwar Sadat. Egypt has 80 million people. P.S. 6 out of the top 7 are Arab & African countries, that tells you something?! 370) Ya bakht men kan el ra2es "............" !! Why am I not surprized that El Hadary issue is ended by the president of the republic who definitely have the football players problems at the top of his important priorities! Thank God he could contain it, or else he would have to carry it over to the "Arab Summit" but he is not expected to go to the summit anyway!! P.S> ya salam law kan el 7adary 3amal zay hany ramzy & hanan tork fe "gawaz bekara gomhoori" we estaghal el forsa we 2al lel rayes 3ala kam 7aga ye7laha fe ghamdet 3een... mashakel el ghalaba in specific, at least taboor el 3esh & the new bottom line for the salaries. 369) Qadafi Latest - 3ayez 7a2i!! This guy -one of the world longest serving rulers- never stops surprizing me. I guess he never had the chance to think "inside the box". I dont know from where did he get all these crazy (yet wise somethimes) ideas!!! His Latest that de decided to Call-off the government, and distribute the extra income from selling the Libyan petroleum directly on the people (5000 Dinar/person). 7aga keda zay fim 3ayez 7a2i beta3 Hany Ramzy! Honestly I am really confused about this guy, sometimes I feel he says or does what we wanna say or do, and sometimes I feel he is in another world! But in all cases, I do respect his honesty with himself and his people and trying to make his country a better place to live (sometimes in a crazy way) specially after letting go of terrorism oriented thoughts. Wel kalam leeky ya gara (el 3ala yemeen Lybia!). P.S> I met him 28 years ago (yes kont soghayar) walking in the street. Do think I will ever meet Mubarak walking in the street?! El Dameer El Arabi: Yanhar Nakad morakaz! heya na2sa, makefaya nasharat el akhbar! Begad I felt as if I watching the news accompanied by sound track! Anyway, if it was me, i would have just gathered all the stars, and said the main chorus word "Matat 2olob el Nas, Matat feena el Nakhwa, Yemken Neseena fe yom en el 3arab Ekhwa" in a 1 min message for the Arab leaders in the Arab summit! Hadary 2: Hady ra7, Hadary geh, 7adary 3aleeh el 3awad. Feeh fel donya ghabaa aktar men keda! ya3nee 10 days ago he was one of the top people in the Egyptian football, now he will be punished by Ahly, and will have a problem in FIFA because running again but this time to Ahly. Tab kan lazmeto eih men el 2awel. Tab3an el press hatet7efna with another week of "3awdet El Hadary" after part 1 "Horob El Hadary", I just hope it ends here before it becomes another Die Hard or Rambo!